On Thursday, during its 24th Annual General Meeting, the Bhutan Chamber of Commerce and Industries elected Topgyal Dorji as its 5th president, and Chen Chen Dorji and Thinley P. Dorji as vice presidents. I offer my heartiest congratulations to the incoming president and vice presidents. 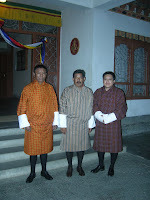 The three unrelated Dorji’s have an important common mission: to force our government to get serious about private sector development. Congratulations Dorji's !!! Welcome to BCCI and we wish you all the best in taking the BCCI foreword. Lyonchen provided a valuable advise to the BCCI during his address NOT TO BECOME & FUNCTION LIKE ANOTHER GOVERNMENT BODY. We think this is a genuine observation and the new leaders elected & appointed should move BCCI away from being one. Also make yourself approachable to any business person at any given time to discuss situation & scenarios so that you avail first hand information from the business community and not from one or two that have access to you. I think we have a good secretary general but he needs guidance and dont amke the mistake of being guided by him as he has no idea about business coming from an engineering background. He is very pro-active and we need to use him work and think for the business community. If I am not mistaken, the three of you have been invoived heavily with BCCI in the past also and we don't want you to sit on the past culture of BCCI again which is not desirable. TRY TO BRING IN A NEW OUTLOOK FOR BCCI AND TRY TO INSTIL A NEW CULTURE FOR BCCI. two dorjis look alike even by the colour of the skin. aren’t they related? or 1/2 brothers?